In this Stukov Build Guide, we provide an overview of his strengths, abilities, talents and matchups. Stukov is undoubtedly my favorite support hero in Heroes of the Storm, thanks to a kit that's not only a lot of fun, but one that's undeniably strong. As a support hero that is undeniably more aggressive than most, Stukov is a welcome addition to any composition. His ability to spread healing, or damage over time to his allies or enemies makes him particularly challenging to play, especially if you not only want to sustain your team, but also get into melee range in order to deal damage outside of Weighted Pustule. What's particularly strong about Stuckov's kit is the fact that despite him being a melee hero (he hits hard by the way), he can perform the majority of his duties from the backline. His heal, Healing Pathogen, has a fairly generous range and is targetted, while it also spreads to nearby allies at least once. His ranged attack comes in two forms, with Weighted Pustule allowing Stukov to infect enemies, causing damage and a fairly heavy slow. Alongside this he also has Lurking Arm which provides a static ranged silence, alongside continual damage for anyone standing inside it. Compared to the likes of Malfurion, Lt. Morales or Brightwing, he's much more damage orientated and yet he's still more than capable of keeping his team alive with relative ease. His trait, Bio-Kill Switch, allows him to detonate all Pathogens and Pustules, in order to spike heal/damage all those affected. Unsurprisingly, key to playing Stukov well is not only managing your Healing Pathogen allocation, but also landing your Lurking Arm, while keeping as many enemy players as possible infected with Pustules. If there's any downsides to Stukov, it's simply that he's tricky to master, but he's also incredibly vulnerable to crowd control. Once he has used his Bio-Kill Switch, his ability to burst heal or deal high an ally or enemy is significantly reduced. Bio-Kill Switch - Stuckov's Trait allows him to detonate all viruses, on allies or enemies. Regardless of what viruses you have active, Bio-Kill Switch will trigger them all and their bonus effect. Considering the lengthy cooldown on this Trait, it's important that you don't detonate too soon, as Bio-Kill Switch grants your only access to burst healing, or burst damage. Ideally you want to read an encounter and judge which you need the most. If your team is very low on health and your Healing Pathogen is spread across most or all of them, it's probably a good idea to trigger your Trait. If the enemy team are looking like they're on the ropes, slowing those infected by Weighted Pustule (while dealing high damage), should swing a fight in your favor. Healing Pathogen (Q) - Key to the sustain that Stukov offers is his Healing Pathogen. The targeted ability allows him to heal an ally over time, while it will spread automatically to nearby allies every 0.75 seconds. What's amazing about Healing Pathogen is the fact it heals for the same amount when it spreads, at no additional mana cost. The only downside to this is the fact its duration is only 4.5 seconds, meaning you've a little over 5 seconds between casts where you can't apply a new heal. Not only that, but if your Trait is on cooldown (which is 16 seconds long), you've absolutely no access to a burst heal. I've found it's particularly effective to simply cast your Healing Pathogen on a key target early, and then hold your next cast until absolutely necessary. This way you still got a lot of healing up time, without neccesarily feeling under pressure to heal immediately with your Trait. Weighted Pustule (W) - This is Stukov's primary form of AOE pressure, and unlike Healing Pathogen, Weighted Pustule doesn't automatically spread. Instead, you can simply cast it through multiple enemy heroes. Those affected suffer low damage over time, while also being slowed. Eventually and over the course of the DOT, players are slowed up to 50%, while the DOT also deals additional damage on expiration. Detonating Weighted Pustule with Bio-Kill Switch causes an even greater slow, and a high amount of damage. Lurking Arm (E) - Casting a small AOE at a targeted location, Lurking Arm allows Stukov to deal damage from afar while also silencing those in his arm's radius. Lurking Arm is an interesting ability as it's easily avoided 1 on 1 (players can simply walk out of it), but it does offer amazing area denial or a huge amount of spike potential against a coordinated team - especially if it's cast during a stun or root. With Stukov having the ability to maintain Lurking Arm until he chooses to cancel it, or is interrupted, it can be a looming threat for the enemy team. I've found Lurking Arm is best used when defending a siege, or when hidden from view. Although you'll become visible when your arm erupts from the ground, you should be far enough away that you aren't in immediate danger. It's also well worth casting when you anticipate your team is going to dive on a high value target. That brief silence - even without crowd control - is a big help. Flailing Swipe (R) - Without doubt a strong heroic, Flailing Swipe allows Stukov to bat back enemy players with a series of larger swings. The damage is largely negligible, but it's the defensive capabilities of Flailing Swing that makes it so valuable. It acts like an alternative version of Mighty Gust (Falstad's heroic) and that can be amazing for protecting your team, or zoning for an objective. Just be aware that the initial swing is shorter than the last, meaning you need to use it plenty early enough if you're to push players away quickly. Massive Shove - Besides the fact Massive Shove is hilarious if you manage to push an enemy all the way back across a Battleground, its value is undeniably good. On most Battlegrounds there simply isn't the space to maximize the push distance. However, the push does allow you to defend yourself 1 on 1 and in a team fight, remove one player far enough away to make any fight 4 v 5 (for a short time, anyway). Not only that, but the stun it causes when you hit an enemy player against scenery ensures even in tight spaces, it buys enough time for your team to spike someone down. Best of all, its cooldown is incredibly short. 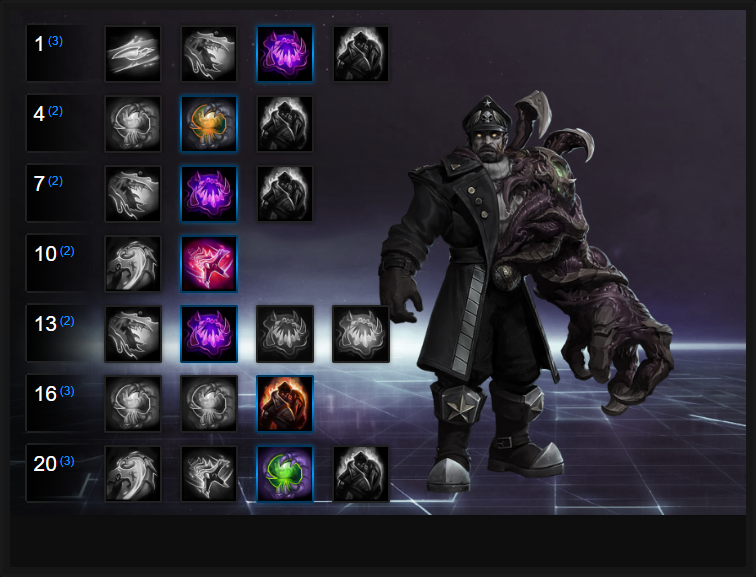 Like our Stukov build guide? You can help support its updates by subscribing to Ten Ton Hammer. Here's the details. While Stukov isn't ever going to set the world alight when it comes to DPS, Low Blow ensures that he can apply significant pressure to a team who are low health. Increasing the damage of Lurking Arm by 100% against Heroes below 30% health, it ensures in long-winded fights that Stukov can apply some serious AOE pressure in enclosed spaces. Variable: If you're after more damage, it's worth taking Fetid Touch. It allows Stukov to lower the cooldown of Weighted Pustule by 5 seconds and removes its mana cost, as long as he hits a total of 30 heroes. Considering Weighted Pustule doesn't spread like Healing Pathogen, gaining the up-time on his primary damage ability is incredibly good. It ensures that when you use Bio-Kill Switch that you're highly likely to always have an active Pustule, while it allows Stukov to keep the enemy team slowed much more often. While your Healing Pathogen is active, Biotic Armor grants 15 to all allies under its effect. In addition, this bonus is increased to 35 armor when you detonate your Healing Pathogen. For mitigating damage, and allowing Stukov to provide even greater sustain, Biotic Armor is amazing. Variable: One Good Spread allows Stukov to lower the cooldown of Healing Pathogen by 2 seconds if it spreads to 3 targets. Not only that, but it also refunds 10 mana. Effectively, it allows you to heal once every 8 seconds, for a cost of 10 mana. Considering Stukov only has 1 heal, it's important to ensure this is constantly available. By default the radius of Lurking Arm isn't great and most players can skirt around its edges easily. Growing Infestation allows Stukov to increase its size by 50% over 2.5 seconds, allowing him to lock down more heroes, and a much wider area. It's amazing when defending, or sieging a structure. The only downside is a slightly longer cooldown on Lurking Arm (+4 seconds), but this is manageable). Providing Stukov with a low cooldown push, Massive Shove can remove a single player from the fight near instantly. It takes some practice to know where to push players to maximize its range, but it can be absolutely invaluable. Better still, the heroic gets stronger and stronger as the game gets to its later stages and structures are destroyed. Its strongest in lane, but still fantastic everywhere else. The stun it provides can also buy you time, or allow your team to secure a kill. It Hungers increases the range of lurking arm by 20% but also ensures if you damage any Heroes 15 times, its cooldown is reset and mana cost refunded. In a group-fight situtation, this is easy to maintain and ensures it can be cast much more regularly, from a safer distance. Variable: If you're seeking control, I've had a lot of success with Virulent Reaction. It grants Stukov access to an invaluable root as long as you use you detonate a Weighted Pustule against a player affected by your Lurking Arm. Effectively, you simply send out your Weighted Pustule onto a key target, quickly hit them with your Lurking Arm (with extended range!) before triggering your trait. It's a near instant root that also causes silence and massive damage; it's fantastic when used against a high value target. If you're wanting to gain tons of healing output (and sustain), take Pox Populi. When you use your trait, it will automatically set the remaining duration to 3 seconds. This not only gives you more healing over time, but also ensures that it's not long before your Healing Pathogen is off cooldown, by the time your current one wears off. Pox Populi also pairs amazingly well with Biotic Armor. Providing Stukov with amazing healing output during early fights, Top Off boosts the value of Healing Pathogen by 30% when allies are over 60% health. Considering how easily Healing Pathogen can spread, this massively increases Stukov's healing over time. Variable: Push Comes To Shove allows Stukov to push enemy players 25% quicker while also allowing you to reduce its cooldown by 15% if you push a target for more than 1.25 seconds. For the increased push speed, it's worth taking as it allows Stukov to peel quickly and get away, before being focused. These Hero Threat Levels (1 being lowest threat and 10 being highest threat) are to help you determine which enemy Heroes can give you a headache. For the Heroes listed here, take extra care as they're particularly dangerous for Stukov. Arthas: His root combined with his slow aura makes life difficult for Stukov, as you've no real means to escape him if Flailing Swipe is off cooldown. This list of tips and tricks are just a handful of things we think will help your Stukov play. We'll continue to add to the list as required and if you have any tips you'd like to share, let us know in the comments below and we'll place them here. 1. Bio-Kill Switch has a lengthy cooldown (16 seconds). Do not waste it - only use it to seriously hurt the enemy team, or to keep yours alive by burst healing. 2. Bio-Kill Switch will always detonate all virsus', regardless of how many you have in effect. 3. Remember that Bio-Kill Switch boosts the slow on Weighted Pustule from an eventual 50%, to 70%. That's a huge slow that can cripple most teams and their mobility in any team fight. 4. Healing Pathogen will always spread randomly to nearby allies, from the first recipient. I'd recommend trying to cast it on your front-line so that the Pathogen only has one place to go: back towards your team. 5. Healing Pathogen doesn't heal a huge amount (53 health per second), but it does last a long time. Try to cast it early so that your cooldown is almost up by the time you need to re-apply it. 6. You don't need to aim to land Healing Pathogen, you simply need to click on an allied hero of your choice. For anyone under pressure, just hit your trait the moment your Pathogen lands. 7. Weighted Pustule casts in a straight line and only affects heroes. Ideally you want to infect as many as possible so that the enemy support is under pressure to keep their health up. 8. There is an audio queue for the increased slow effect on Weighted Pustule - its audio gets dramtically louder the slower the enemy gets. 9. Lurking Arm prevents Stukov from moving when cast, but he can maintain it without a reduction in his mana. It's amazing when defending a narrow area, if you're at the back. 10. You can use Lurking Arm from a bush or vent for a surprise attack that the opposing team likely won't expect. 11. With talents, be sure to Root someone with a quick Lurking Arm combo (see above). Your team will be able to quickly spike them down while they're silenced. 12. Save your Flailing Swipe for defending your team, or zoning for an objective. The damage is so low it's only for defensive purposes. Thanks for reading our Stukov build guide. You can help support its updates by subscribing to Ten Ton Hammer. Here's the details.